Is the Fed Shooting Blanks? 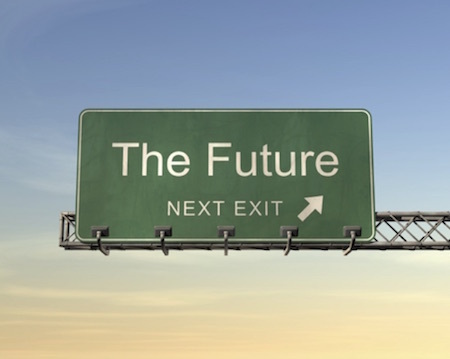 Why do investors spend so much time thinking about the future? Any conclusions we reach are necessarily speculative. No one has a crystal ball. The efficient market advocates are correct when they note that we can’t predict the future. However, they’re wrong to say forecasting is useless (and they are off base with many of their other conclusions!). While we can never be 100% confident about tomorrow, we can often get close. Just as the universe abides by known physical laws, the economy follows known principles of human behavior. People try to minimize pain and maximize pleasure. If you can anticipate how they will do so, you can forecast economic results, not with perfect reliability but with high confidence. And so we spend a great deal of time forecasting outcomes for our businesses and investments. Timing is the main challenge. We may know (or at least think we have a good idea) what people will do – but not when they will do it. How much pain/frustration/disappointment can they withstand before they give up and surprise us by opting for a totally different direction? That’s a key question for both sides of the Brexit decision. When central bankers like Janet Yellen or Mario Draghi speak, we have to discount their statements because they have policy agendas to promote. While the BIS has an agenda, too, the bank isn’t tied to any particular economy or government. Its analysts are paying attention to how the world functions in toto. We in turn should pay attention to their warnings. So in this letter we’ll dig into the BIS annual report, parse how their views differ from everyone else’s, and discuss why we are all feeling considerable angst about the future. We will start with the BIS report. The report’s first chapter has a provocative title: “When the Future Becomes Today.” That’s the one thing we know for certain about the future: it is forever arriving, and it is our job to face it head-on. Just over a year ago, at SIC 2015, we had the honor of hearing Bill White speak. He is a former BIS chief economist and now chairs the OECD Economic Development and Review Committee. Bill is more plugged in to the international central banking network than anyone else I know. He famously pushed Alan Greenspan to raise interest rates in 2003 so the Fed would have a cushion to use in the next crisis – which Bill thought would come along in a few years. Sure enough, he was right. In my opinion, Bill is responsible for setting the current tone of research and analysis at the BIS. Bill told us last year that the world’s central banks were making a mistake with their single-minded focus on monetary policy. He noted, correctly, that monetary solutions have not helped, and he stated emphatically that more of the same won’t help, either. That is the problem with having a monetary policy that is influenced by the political temperament and decisions of a small group of people. What happens is that people look around for scapegoats when a recession comes along, and they will point to a central bank that wasn’t as accommodative as they would have liked and blame the bank rather than simply understanding that the business cycle is what it is. Bill White is my favorite central banker. Central bank models, he told us, are artificial machines. His best quote was, “The basic problem with central banks: they think they know how the economy works.” Their models are built to be gamed and always assume a return to equilibrium. But there is no equilibrium – you are where you are. The problem with equilibrium models is that they don’t reflect reality. Reflecting on these matters now, we see that central banks are no closer to finding the equilibrium they so desperately look for. They are actually farther away, having pushed rates negative in Japan and throughout Europe. I don’t know whether they are following their models or not, because I can’t imagine what model would lead them to the places they have taken us. Nonetheless, here we are. The results of negative rates in Europe have been disastrous for banks and insurance companies, not to mention pensions and fixed-income investors. The single-minded focus of current economic thinking is that the driver of the economy is consumption and/or the artificial replacement of private consumption by government debt, which will create desirable inflation. This tenet, trumpeted most famously by Paul Krugman, is going to bite us all – not just rear-facing economists – in our collective derriere. And that is the essential message of the new BIS report. The BIS report doesn’t say that the global economy is in a terrible place. Growth is disappointing, sure, but it could be much worse. Unemployment is still too high but is getting better. Inflation isn’t a problem in most places. 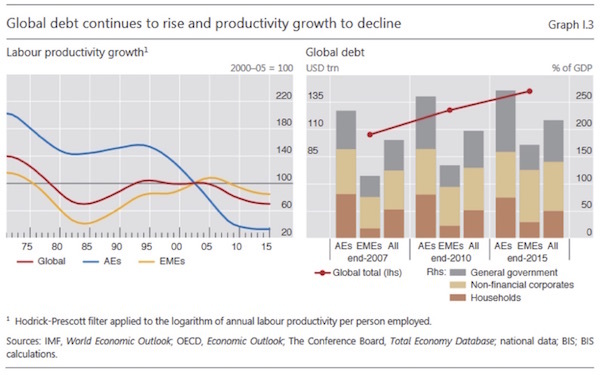 What worries BIS, though, are the long-term consequences of what they call a “risky trinity” of unusually low productivity growth, stubbornly high debt levels, and little room for policy maneuvers. That combination is responsible for persistently low interest rates. This is an important point. Ultra-low, zero, or even negative interest rates are not themselves the problem; instead, they are symptoms of the “risky trinity” syndrome. We can (and must) treat the symptoms, but doing so won’t cure the disease. Interest rates aren’t simply the cost of borrowing liquid capital. They are ultimately the price of money, the single most important price-signaling mechanism in the economy. Rates tell us a lot about confidence among both lenders and borrowers, not to mention consumers. The contrast between global growth that is not far from historical averages and interest rates that are so low is particularly stark. That contrast is also reflected in signs of fragility in financial markets and of tensions in foreign exchange markets. One thing we don’t have to wonder about is the impact of rising debt. The world is just as addicted to debt today as it used to be addicted to OPEC oil. You might think the pace at which we leverage ourselves would be slowing as regulators crack down post-crisis. Not so. Total debt in all categories (except households, whose debt has shrunk only a very little in the advanced economies since 2010) is still growing at a steady clip relative to GDP. The right-hand chart above shows global debt growing. Pretty much everyone is in hock to someone. Pay down private debt, and government debt goes up. Reduce government debt, and household debt rises. This is what addictive behavior looks like. Forget heroin and OxyContin; debt is the world’s favorite drug by far. Periodically, addicts concerned about outcomes try to get clean. The results are never pretty at first. Our politicians, unwilling or unable to go through the painful detox process, always go back for another fix. Dealers are always happy to provide. The dealers, in this context, are banks – and central banks more than private ones. This addiction to debt is one reason we keep having market tantrums. Last year people got concerned about China. Before that it was Greece. Now China is off the radar (even as its currency drops more than it did during our tantrum last summer); and we’re obsessed with the UK, Germany, and Italy. BIS says the results of this oscillating calm and turbulence are troubled equity markets, wider credit spreads, a stronger dollar, and lower long-term interest rates. I noted above that interest rates have an important signaling function. What happens when the signals are wrong? People make bad decisions, of course. And, for at least the last six years (perhaps more), the signals have been very wrong indeed. Distorted signals spurred an epidemic of unwise choices. Worse, many of those bad choices were made by central banks, which, by virtue of their size and position, can spread the infection far and wide. What we have seen is the financialization of business markets, as businesses are incentivized to buy their competitors rather than competing or to buy their own stock with cheap money rather than invest in new productive processes. Neither of those options boosts employment or labor productivity, which is why you see a slowing economy. Truly “free” markets exist only in theory. Maybe interest rates would find a real equilibrium in a free market, but we can’t know this because our markets aren’t free. What we actually have is a muddled mixture of market forces, political decisions, and human folly. Importantly, all estimates of long-run equilibrium interest rates, be they short or long rates, are inevitably based on some implicit view about how the economy works. Simple historical averages assume that over the relevant period the prevailing interest rate is the “right” one. Those based on inflation assume that it is inflation that provides the key signal; those based on financial cycle indicators – as ours largely are – posit that it is financial variables that matter. The methodologies may differ in terms of the balance between allowing the data to drive the results and using a priori restrictions – weaker restrictions may provide more confidence. But invariably the resulting uncertainty is very high. This uncertainty suggests that it might be imprudent to rely heavily on market signals as the basis for judgments about equilibrium and sustainability. There is no guarantee that over any period of time the joint behaviour of central banks, governments and market participants will result in market interest rates that are set at the right level, ie that are consistent with sustainable good economic performance (Chapter II). After all, given the huge uncertainty involved, how confident can we be that the long-term outcome will be the desirable one? Might not interest rates, just like any other asset price, be misaligned for very long periods? Only time and events will tell. For what it’s worth, I think there is no question that interest rates have been misaligned for quite some time now. When 12 people or 27 people sit around a table and decide what the price of the most important commodity in the world is (that would be the interest rates for money), how can they possibly get it right? The evidence is that, more often than not, they don’t. But what would happen if the central banks didn’t set rates? Oh dear gods, market participants intone, we would have unrestrained volatility and uncertainty. That is true, but central bank misjudgments about economic trends, translated into interest rates, eventually lead to crashes and result in markets far more volatile than we would experience with lesser, more numerous adjustments that didn’t involve control of rates. I know it is difficult to admit this, but think about it. Can’t stock prices go irrationally low or high? Of course they can. Do they then adjust? Of course they do. We’ve all seen them do it and can point to many examples in market history. So why should interest rates be any different? We have, all of us, built an economic and political system that encourages and subsidizes debt. Is it any surprise that we have created an excess supply of it? Of course not. There is a great irony here, in that more and more countries are penalizing income and savings – and then we worry about incomes not growing enough. By now, it should be a well-understood concept that if you subsidize and set the price for a commodity (like debt) below its actual market price, you’re going to get too much of it. Debt is future consumption brought forward. Once debt is incurred, consumption that might have happened in the future won’t happen, and it should come as absolutely no theoretical surprise that at a certain level of debt, growth and income begin to diminish. That is exactly what we are seeing in the real world, even if those who espouse the reigning economic paradigm (Keynesianism) are still in love with their beautiful theory. There are basically two categories of debt: debt used to purchase or create productive activities (like tools for a carpenter or a new factory for a business) and debt used to consume. As noted above, the BIS is in the unique position of serving global economic stability in general and central banks in particular. It can criticize central banks more freely than politicians, bankers, or business leaders can. The BIS is usually gently critical in public documents, but I’ve always wondered what happens behind closed doors. I am told by reliable sources that the conversations can get rather blunt, especially in the monthly meetings of global central bankers. The current report ratchets up the public level of the BIS’s concerns. Financial markets have grown increasingly dependent on central banks’ support, and the room for policy maneuver has narrowed. Should this situation be stretched to the point of shaking public confidence in policymaking, the consequences for financial markets and the economy could be serious. Worryingly, we saw the first real signs of this happening during the market turbulence in February. In other words, what happens when banks, investors, and the public lose trust in the Fed, the ECB, the Bank of England, and the Bank of Japan? The BIS isn’t talking about the sort of routine grousing we all engage in. Everyone gripes about the Fed in good times or bad. But beneath our chronic irritation, we still maintain a fundamental trust that the Fed will step in to prevent any cataclysmic event. What if that’s not true? What if the Fed really is out of bullets? If you ask almost anyone associated with the Fed, they will tell you they still have choices and ammunition. The problem I worry about is, do they actually have any more live bullets? I’m quite concerned that in the future they will be “shooting blanks,” and the expected economic responses will simply not happen. The irony is that, like actors in a grade B action movie, they will keep pulling the trigger and shooting those blanks. Somehow, they seem to think the “editing” process will make their economic movie seem more real. We all hope not to learn the answer to my question. The BIS drops a pretty loud hint, though. With its “Worryingly” sentence, the BIS confirms that we are right to wonder about the continued efficacy of central bank action. Having worried us about policymaking, the BIS goes on to offer some policy suggestions. They group their ideas into three sections: prudential, fiscal, and monetary. By “prudential” policy, the BIS means bank regulation and capital requirements. Much has changed on that front since the last crisis. The Basel III framework is forcing banks to hold more capital to cover the risks they take. This requirement is having the effect, according to many traders, of drastically reducing bond market liquidity. The BIS concedes the point but responds with an argument I haven’t seen anywhere else. Before the last crisis, they say, liquidity was actually underpriced. Liquidity providers, having not been fully rewarded for the value they provide, then disappeared when everyone really needed them. Central banks and governments had to step in and take their place. To avoid this dynamic in the future, BIS suggests we should be happy to pay more for liquidity than we are accustomed to doing. We should pay market-makers well in good times so they will be there for us when a storm hits. The best structural safeguard against fair-weather liquidity and its damaging power is to avoid the illusion of permanent market liquidity and to improve the resilience of financial institutions. Stronger capital and liquidity standards are not part of the problem but an essential part of the solution. Stronger market-makers mean more robust market liquidity. I deeply suspect this language is really a veiled criticism of high-frequency algorithmic trading. High-frequency trading (HFT) creates an illusion of liquidity. Depending on whom you choose to believe and how you measure it, HFT may be 70% or more of total market volume. This trading will immediately disappear if we actually need liquidity. It is simply a canard foisted on the public by exchanges and funds that use HFT to say that these entities are providers of liquidity. HFT is precisely what the BIS is talking about when they use the term illusion of market liquidity. It makes me wonder if we are going to miss the “specialist” role the NYSE has traditionally had for the trading of most listed stocks. The exchange has nearly done away with all that and thought it could make up for the lost fairness and market equilibrium with volume. I’m not sure it has worked out that way. 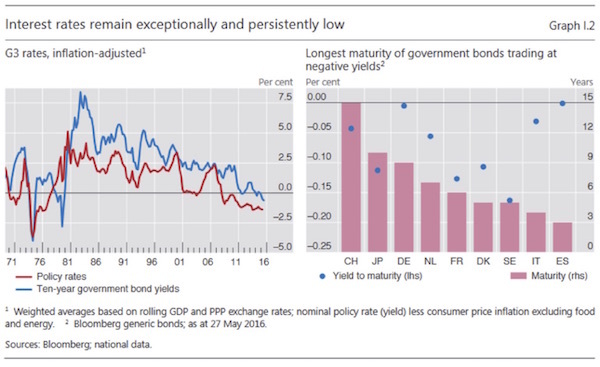 In the fiscal policy area, the BIS says we should rethink how we evaluate sovereign risk. Because governments – or at least the ones that have their own currency – can always “print money,” investors assume their credit risk is low or nonexistent. That’s clearly not the case. Ask someone who invested in Argentine government bonds a few years ago, and they will explain. Whatever governments deliver in reduced credit risk usually gets offset by higher inflation and interest-rate or market risks. We need to think about risk as a liquid substance. We can move it from one bottle to another, split it among multiple bottles, or put it in the deep freeze, but we can’t make it disappear. Even pouring it down the drain just transfers it to someone else. If prudential and fiscal policies were properly organized, we would not need to rely on central banks so much. But that doesn’t mean central banks should be inactive. 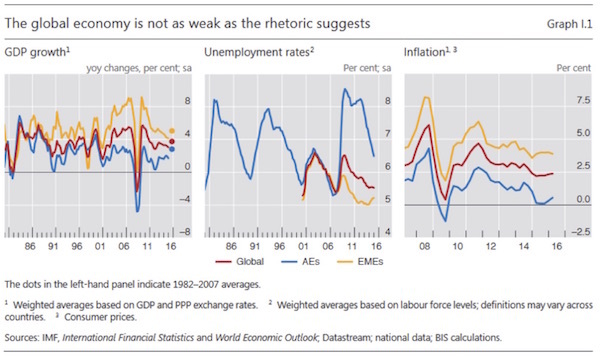 The BIS does explicitly argue for a strong monetary policy role. However, they think that role should look different than it does today. One big change they suggest is to rely less on inflation targeting. Stubbornly low inflation is what has kept policy accommodative ever since the 2008 crisis. In hindsight, it may have been better to tighten interest rates back toward “normal” (whatever that is) long before inflation rose back to “normal” (whatever that is)..
It’s hard to say how this approach would have worked in practice. Looking back, by 2011 the US was out of recession and stocks were doing well, but unemployment was still stubbornly high. Unable to drop rates any further, the Fed launched quantitative easing instead. The ECB is now doing something similar but even more aggressively. For three or four years, the Federal Reserve used the excuse that unemployment was unacceptably high; and then when unemployment got close to the “normal” range, they simply refused to pull the rate-hike trigger. They worry about stock markets more than they worry about the imbalances they are creating. They are in danger of losing their credibility, which would be damaging to all of us. My friend Ben Hunt writes one of the more thoughtful letters I read. I’m going to summarize what I believe to be his views – perhaps because they reinforce my own. Ben talks about the power of the Common Narrative, the things that we all know and believe. Much of this is what we learned growing up about our countries or religions. These narratives (and there are more than a few of them) shape our prejudices and our actions. This is not necessarily bad, as more often than not these narratives can encourage socially beneficial behavior. What I care deeply about, however, is how the Narrative around these events is being shaped and reshaped, because that Narrative will determine the path and outcome of every election and every market on Earth. And what I can tell you is that I am shocked by the diminishing half-life of status quo protecting Narratives, by the inability of Big Institutions and Big Money and Big Media and Big War and Big Academia to lock down an effective story that protects the State, even when their competition is primarily comprised of clowns... There’s a … tiredness … to the status quo Narratives, a Marie Antoinette-ish world weariness that sighs and pouts about those darn peasants all the way to the guillotine…. Why are the status quo protecting Narratives faltering so badly? I think it’s because status quo political and economic institutions – particularly Central Banks – have failed to protect incomes and have pushed income and wealth inequality past a political breaking point. They made a big bet: we’re going to bail-out/paper-over the banks to prevent massive losses in the financial sector, we’re going to inflate the stock market so that the household sector feels wealthier, and we’re going to make vast sums of money available for the corporate and government sectors to borrow really cheaply…. We all know what happened when the narrative surrounding the price of housing and subprime debt collapsed in 2008. You don’t have to be much of a historian to come up with many examples of collapsing narratives. War in Europe is impossible, we were told as late as 1913. And more recently, the British wouldn’t actually vote to leave the EU. Central banks around the world have pushed the limits of what their credibility can actually deliver. I truly worry what will happen when we enter the next recession and everybody realizes that the Federal Reserve, the ECB, the BOE, and the BOJ are shooting blanks and the emperor has no clothes. Given the mood in countries all over the world and the frustration of the Unprotected class with the seemingly impervious Protected class (which will be compounded if we have another protracted income recession), the level of uncertainty regarding future events is at least as high as it has been at any time in my life. The next recession, whenever it comes, will result in a completely different type of global crisis than we have seen in the experience of those alive today. Oh, there will certainly be some things that rhyme with history, but I think we would have to go back to the ’30s to find a period roiled with this much social upheaval. Investors are going to require a different type of portfolio management and structure. You really need to rethink your commitment to a long-only portfolio, especially if you are over 50 years old. I know that’s difficult to contemplate, because the Federal Reserve and the ECB have made normal fixed-income investing impotent. But moving out the risk curve today is fraught with peril. We leave Thursday for Las Vegas, where I’ll give a few speeches at FreedomFest and catch a few shows but also spend a lot of times with friends and take in some of the presentations. Back home on Sunday, I don’t leave Dallas until the first few days of August, when I will go to Grand Lake Stream, Maine, for the annual fishing trip with my youngest son, Trey, and several dozen economists, analysts, and newspeople. It’s an economic Bacchanalia, and we’ll have plenty to chew over this year. I know I complain about absurdly low interest rates, and they do affect all of us who would prefer to have more fixed income in our portfolios; but many of us also benefit from low rates. Two years ago I actually bought a home (technically an apartment in a high-rise) for the first time in 20 years, benefiting from low rates. There was actually a bidding war for my mortgage business. Who knew that banks actually got into a bidding situation over a mortgage? That was my first clue that things had changed. The next clue came a few months ago when my banker at Capital One bank, Clinton Coe, who was one of the losers in the last bidding war, called and asked me if I would like to refinance my mortgage for no points at ¼% lower. I would have been silly not to, so I told him to go ahead and get the paperwork done. I had originally done a 5-year, 30-year amortization, ARM (adjustable-rate mortgage) at 2.75%, expecting that there would be another recession within five years and that I would get to refinance my mortgage at what would probably be a lifetime, if not generational, low, at which point I would tell them to back up the truck and give me as much money as they could for as long as they could. This new refinance just extended my option on a recession an extra two years, except on better terms. The fascinating thing is that, as we were sitting down a few weeks ago to sign the paperwork at my home, we came to the page with the actual interest rate and costs detailed, and Clinton pointed out that he had assumed that I would want an additional 1/8% less, and so he did the paperwork that way. I don’t think I can ever remember a banker agreeing to a price and then coming in at a lower rate. I am not that big or important a customer at Capital One. I barely make their cut-off for business activity. That just tells me that the world of bank lending has truly changed. It has truly turned upside down. Oh, the final rate? 2.375% for five years. Clinton tells me they are doing the mortgage for their own “book,” which leads me to wonder what kind of return on capital banks are actually trying to procure these days. I shake my head. Oh, yes, I still have my mortgage hedged in yen. The yen has gone way down and then back up since I put that trade on, back to about where it was. But is was a ten-year option, and I am patient. Staying home this summer has allowed me to get in much better physical shape, and I’m actually losing some weight, down some ten pounds in the last six weeks or so. But the mirror tells me we are only about halfway there. And everyone knows that the last ten pounds is the hardest to lose. I see a reduced-calorie diet and more gym time in my future. At least I’m back up to 60 push-ups at a time. And with that, let me wish you a good week as we all consider the implications of the tragic events here in Dallas. I live quite close to downtown, but the skyline (which is quite beautiful at night) kept us from realizing what was going on, except for the number of helicopters. We were actually sitting reading when we began to get numerous texts from friends asking if we were okay. While we were only a half mile away, it almost seemed as though the shootings must surely be happening on the other side of the planet. How could something like this happen here in Dallas? It’s not a pleasant thought to close on, but that is what is on my mind. It is just not the narratives of central banking that are in danger of imploding. July 11, 2016, 1:32 a.m. But why believe that market rates can be set at a rate “consistent with sustainable good economic performance”? Either that is a tautology or it is just a result of a healthy economy in which rates are determined by market activity, not established by fiat. “Market rates” driving the economy makes no sense - if it did, we could just apply a little game theory to the “markets” and have it all. Doesn’t work that way, never has, as both left and right agree (though from different extremes)- the economic world is far more complex, far more interactive with reality, far more susceptible to swans of all colors. Economic theory is broken, but as long as it insists on fixed hypotheses, assumptions, and theoretical models, it will remain broken. July 10, 2016, 7:20 p.m. The dumb question that nobody answers: Who is buying negative rate bonds out 15, 30, and 50 years? Forget about 1-5 years for now. Unless you are forced, coerced, to lend money and to pay the borrower for 15-50 years, you will do so only if you think there will be deflation for decades. That happened in the depression for about one decade, but we know how to prevent long-term money supply collapse and severe deflation. Get some photos of people buying negative interest rates for 15-50 years. What do they look like? Are they cone heads, or are they from France? Ask them why they want (have) to pay interest and inflation (and give up their liquidity) for about 15-50 years to receive back Yen, Euros and Swiss Francs, for whatever they’re worth, in 15 to 50 years? July 10, 2016, 1:35 p.m. The central banks seem to be the bad guy du jour, but here in the US we should also address the trillions of dollars borrowed for tax cuts and foreign wars, which may be more significant financial engineering experiments than what the Fed has done.